MOSCOW, October 16. /TASS/. The Patriarchate of the Turkish Orthodox Church on Tuesday filed a lawsuit with the Istanbul Prosecutor’s Office to demand a criminal case be opened against the Ecumenical Patriarchate of Constantinople for violating Turkish laws and instigation fraught with a conflict between Russia and Ukraine, the Church’s spokeswoman, Sevgi Erenerol, told TASS. "The political activity of the head of the Patriarchate of Constantinople and members of the Synod has gone beyond the bounds of religious duties and violates the 1923 Treaty of Lausanne, by which he (the Patriarch) was left in Turkey for meeting the religious needs of the Greek minority in Istanbul and on the islands (in the Sea of Marmara), and the existing Turkish laws. This activity is instigative and can cause enmity and conflict between countries in our region, in particular, between Russia and Ukraine," Erenerol said. According to the Turkish Orthodox Church’s spokeswoman, one of the reasons for filing the lawsuit was the September decision made by the Synod of the Patriarchate of Constantinople to declare that Phanar was beginning the procedure of granting autocephaly to the Ukrainian Church. "The head of the Patriarchate of Constantinople, Bartholomew (birth name Dimitrios Arhondonis) is accused of committing crimes punishable under Turkey’s Criminal Code: instigation aimed at inciting hatred and hostility; negligence in performing religious duties; and instigation of a country to war," Erenerol said. The Turkish Orthodox Church was established in 1922 under a government resolution. 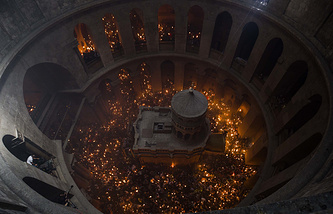 The authorities’ aim was to create a national Orthodox Church connected not with Greek Orthodoxy but with the Patriarchate of Constantinople. It is not recognized as canonical by other local Orthodox churches. The Synod of the Patriarchate of Constantinople met in session on October 9-11 to declare that it was beginning the procedure of granting autocephaly to the Ukrainian Church. It canceled the 1686 decision on the transfer of the Kiev metropolitan diocese to the Moscow Patriarchate. Also, it lifted anathema from the heads of two uncanonical churches in Ukraine - Filaret, of the Kiev Patriarchate, and Makary, of the Ukrainian Autocephalous Church. Besides, it declared the wish to return the Kiev Metropolitan Diocese to the jurisdiction of the Ecumenical Patriarchate. In response, the Synod or the Russian Orthodox Church on October 15 made a decision to end eucharistic relations with Constantinople.